With the continuous addition of films to the coming-of-age canon, it can often feel as though there is a dearth of originality. 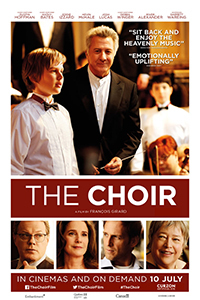 What is offered up by The Choir (2014) has a promising set-up that allows a window to be carved out, for audiences to witness a personal pivot in one child’s rapid development towards manhood. But something feels hollow here. Maybe its the typical signposts of the coming-of-ager that are put firmly into place, or maybe its the squandering of the talent of an absolutely Grade A cast that holds back what is otherwise a fairly serviceable film. Stet (Garrett Wareing) is literally from the wrong side of the tracks. Living in a rundown house with his conspicuously unconscious mother. He’s a tough guy (or so he likes to project), who is first shown with an aptitude for music but a lack of discipline. When his teacher, an enthusiastic Ms. Steel (Deborah Winger) brings the world-renowned Boy Choir to showcase at school, she hopes to also have Stet audition as well. Despite a ruined chance, the death of Stet’s mother propels him closer to the Boy Choir Academy, where his father may have bought his entry but Stet must prove himself capable of becoming a part of the choir. The notion of finding one’s own voice is a particularly apt thematic thread throughout this film, realised through song. The boys’ voices are nothing short of breathtaking in their collective harmony. Watching Stet put himself through the intense paces in order to simply get to his peers’ level of mastery is warming in itself. Furthermore, channeling this world of baroque arrangements and the unabashed youthful adoration of it through the eyes of a steely 11-year-old is engaging; Stet’s discovery and appreciation for the music rivals the audience’s own. But all of this magic is somewhat hampered by the complete mishandling of the talent that this film has at its disposal. Dustin Hoffman, Kathy Bates, Eddie Izzard and Kevin McHale all receive billing here, and for what? While their appearances may lend to the stature of the film, watching them feels like observing an athlete warming-up before the big game. They go through the paces, appropriately firebrand or inspiring when the script requires it, but is that enough? The misuse of Hoffman – who doesn’t become a true part of the narrative until a third of the way in – is the most disheartening. While he is meant to play the inspiring mentor, we never get to tune into the personable self. He is always distant, delivering the bare minimum to make for an effective performance. Overall, The Choir is a lovely, hollow thing. Hoping to reap the rewards of otherwise fallow land in the arena of adolescent drama, this film is be best considered as a safe, warm family film. But don’t come looking to be blown away or deeply affected by the performances or story it puts forth.